Hello Summerhill Pools, Inc. customer! We first off want to congratulate you on passing all of the pretty and beautiful swimming pools to take a moment and inspect this dirty and rugged job site. Did you bring your hard hat and steel toe shoes? No? Yikes! Well, that’s okay. Just don’t tell Mark that you are here. Since you stopped by, we are happy to give you a tour anyway. Welcome to the Treemont Job! This pool is currently a work in progress and we are already off to a running start. We have a lot of information to share with you so we will go ahead and dive down into it! What you see before you is a pool shell that is being created before your very eyes! This stage of the project is known in the pool world as the Shotcrete stage. At this point, we have already Excavated the earth, run our Plumbing, installed our Electrical, laid our Rebar and added our Forms. Not sure what all of this means? Don’t worry, we are continuously publishing more articles to fill you in! To provide a little explanation – Shotcrete is a pre-mixed concrete solution that we inject into the rebar to produce a rigid pool shell. 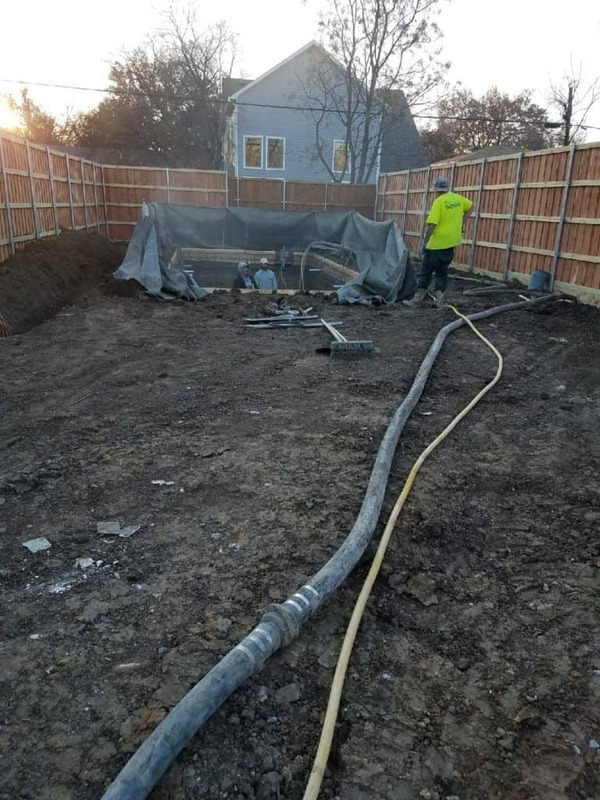 We use shotcrete compared to gunite, which is the standard of the pool industry. Shotcrete is stronger, costlier and about 8 times stronger than its gunite counterpart. This image illustrates the rugged yet delicate process of installating Shotcrete to form our pool shell. Shotcrete is the process of shooting pre-mixed concrete solution into the rebar forms to produce a rigid shell. We use shotcrete compared to gunite (standard of the pool industry). Shotcrete is stronger, costlier and about 8x stronger than its gunite counterpart. In order for the Shotcrete to take on the shape that we need we install Forms. More simply put, forms are aluminum or plywood that are braced along the walls to create a stable structure that creates our pool shape. Secondly, we also use Rebar to produce an interlocking web of reinforcement material for the shotcrete to grab hold of and adhere to. This is a technical and labor-intensive process that typically takes 1-2 days to complete. If you ever watch a rebar installation crew you will be amazed at the speed that some of these craftsmen are able to tie steel! It’s certainly something to see if you are at one of our job sites. As you may have already guessed, we orchestrate this entire process based on our designs and Pool Studio renderings that we create during the planning stages. You will be guided through the entire phase of our design process and given every option to design, shape, and create any pool that your imagination can create. This is the fun stage of the process and one that we enjoy every time! Now that we have either provided a path to enlightenment or bored your socks off, we think its a great idea to give you some more specifics on the Treemont Job itself. We would like to note, some of the materials listed in the above list are not installed yet but will be soon! Rest assured, we will be posting another article on this beautiful Treemont pool very, very soon and will include some beautiful images of this completed pool. To the Treemont family, we are very grateful for your business and blessed that you selected Summerhill Pools, Inc. as your premier Dallas Pool Builder!